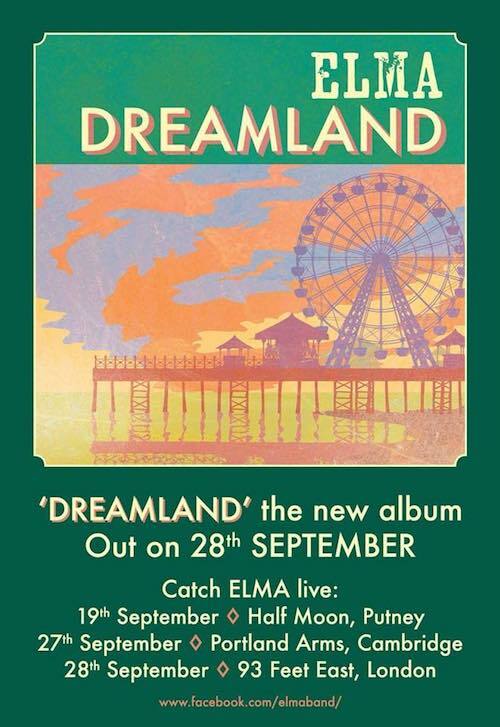 Retro duo Elma revive and re-interpret many aspects of sixties pop genres on their long awaited debut long-player ‘Dreamland’. The title track sets the agenda with its sparse instrumentation, a leisurely waltz time, smooth melody and of course a lyric of regret and longing sung by the golden voice of Ellie Gillett. It conjures up the russet shades and faded grandeur of the deserted fairground and art-deco cinema on the album sleeve. Some of the tracks have been released before as inviting aperitifs to this full collection; the glorious stomp of ‘California’ and their four-track EP including the heartbreaking ballad ‘Butterfingers’. Mark Ellis orchestrates a full band sound with plenty of brass for anthem of independence ‘On My Way’ (featuring another fine middle eight and instrumental break). ‘The Game’ is a beauty, the atmospheric introductory waltz creating an image of a rainy London street in the 1960s or a black and white TV detective series theme, then the jazzy vocal takes control and lifts it to another level, with a big chorus suddenly appearing. Then the album ends with two excellent and contrasting tracks; ‘All I Want’ is an appealing and effortless lounge-music vignette, the voice floating above lighter-than-air electric guitar work, bass and brushed drums, with a piano solo too. Finally, if ‘Butterfingers’ left the listener in emotional turmoil, then ‘Late To The Party’ has surpassed it with lines like ‘….you did all that you could boy, you wrote our names in the clouds, too bad that I wasn’t looking up…..’. Over simple and effective acoustic guitar chords, Ellie delivers a show-stopping vocal performance of nuance and emotion, worthy of this superb song. Elma are launching the LP with live dates featuring a full band, including a show at The Portland Arms in Cambridge on 27th September…. This entry was posted in Music and tagged album, elma, LP, review on August 23, 2018 by iknoweno.